Thu, Jul 5, 2018, 09:51 pm SL Time, ColomboPage News Desk, Sri Lanka. July 05, Colombo: The United Nations Population Fund (UNFPA) and the Ministry of Women and Child Affairs together with the High Commission of Canada to Sri Lanka, on Thursday inaugurated a two-day workshop, on multi-sectoral services responding to women and girls subject to violence. A wide cross section of agencies, including Government ministries and departments, frontline service providers, UN agencies, Civil Society Organizations and Non-Governmental Organizations participated in the workshop focused on the coordination, effective delivery and quality assurance of essential services. Speaking at the event, Member of the Sectoral Oversight Committee on Women and Gender, MP Dr Sudarshini Fernandopulle said despite the presence of laws to address gender-based violence, there are many gaps in addressing Gender-based violence in Sri Lanka. She said lack of data is a major drawback and ensuring women and girls have essential services is crucial to break the cycle of violence. A study launched in 2018 by UNFPA in collaboration with the Faculty of Medicine, University of Kelaniya in five provinces reported that, more than 1 in 3 female homicides in Sri Lanka are related to intimate partner violence. Furthermore the 2016 Sri Lanka Demographic and Health Survey (DHS) reported that only 18 per cent of ever married women aged 15-49, who experienced violence by an intimate partner, sought help from the police. "Responding to violence requires a range of essential services that recognize and aim to meet the multiple needs of women and girls who have experienced violence. Quality health services must offer first line support; quality social services must offer information on rights and access to critical resources and effective police and justice services must be cross cutting and women-centered," UNFPA Sri Lanka said in a statement. High Commissioner of Canada in Sri Lanka, David McKinnon, on behalf of the Government of Canada, congratulated the Ministry of Women and Child Affairs and UNFPA Sri Lanka for bringing so many stakeholders together on this important initiative. "This event is a key milestone towards the achievement of the Sustainable Development Goals in Sri Lanka, and particularly the goal pertaining to gender equality, and a concrete step in the implementation of Canada's Feminist International Assistance Policy. Our hope is that the efforts to stop sexual and gender-based violence in Sri Lanka, in Canada and all over the world will ultimately contribute to end poverty and inequality," he said. The workshop provides stakeholders an opportunity to adopt a collaborative and multi-sectoral approach in providing these essential services. In guiding this effort, the workshop launched the Essential Services Package for Women and Girls subject to Violence, in Sri Lanka. The Essential Services Package (ESP) is a global guidance tool identifying core elements and guidelines for the coordinated delivery of essential services for all women and girls who have experienced gender-based violence (GBV). The package reflects on vital components of coordinated multi�sectoral services that should be provided by the health, social services, police and justice sectors. The ESP also provides guidelines for the coordination and governance of these services. Also speaking at the event, Secretary of the Ministry of Women and Child Affairs, Ms. Ashoka Alawatte stated: "To ensure that no one is left behind, we must ensure that evidence-based policies are in place. It is important that we come together to end all forms of violence against women and girls in Sri Lanka." The workshop in Colombo, includes in-depth sessions on health, social welfare and police and justice sectors with key stakeholders. Furthermore the workshop will support the development of a concrete roadmap for the implementation of a multi-sectoral response to gender-based violence in Sri Lanka. Elaborating on the need for gender equality in addressing GBV, UNFPA Representative Ms. Ritsu Nacken said quality essential services must be effectively provided to guarantee GBV survivors' access to comprehensive services without discrimination. "UNFPA, as one of the lead UN agencies in addressing GBV, is committed to working with all our partners to ensure that all women and girls who have experienced violence receive support to recover and seek justice through quality essential services," she said. When essential services are well-coordinated, quality assured and confidential, women and girls who have experienced violence can get the support they need to recover from its effects, break the cycle of violence and strengthen prevention measures. The Essential Services Package forms part of the United Nations Joint Global Programme on Essential Services for Women and Girls Subject to Violence. This program is a global partnership by UN Women, UNFPA, WHO, UNDP and UNODC with support and funding from the Governments of Australia and Spain. 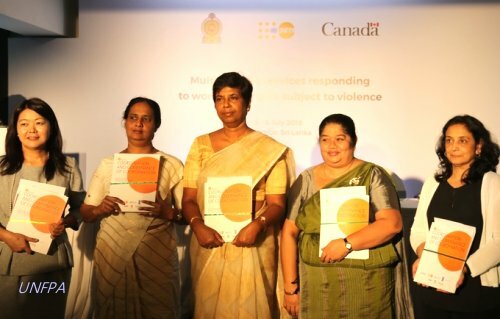 The global ESP was launched in Sri Lanka, by UNFPA and the Ministry of Women and Child Affairs with support and funding from the High Commission of Canada to Sri Lanka, as part of a two and a half year initiative towards strengthening public institutions in addressing gender-based violence. Local and international resource personnel at the event include representatives from the following organizations: The Attorney General's Department, Legal Aid, Ministry of Health, Ministry of Social Empowerment and Welfare, Ministry of Women & Child Affairs, Mithuru Piyasa, Sri Lanka Police, UN Women, United Nations Office on Drugs and Crime (UNODC), United Nations Population Fund (UNFPA), Women in Need, and the World Health Organization (WHO).